The first public presentation of the celebrated Fisher Collection, one of the world’s foremost private collections of contemporary art, is on exhibit at the San Francisco Museum of Modern Art (SFMOMA) from June 25 through September 19, 2010. Doris and the late Don Fisher started collecting art more than 40 years ago, first purchasing prints for the offices of the Gap, the retail company they co-founded in 1969. As the Gap grew, so did the Fishers’ art collection. They ultimately amassed a breathtaking and significant collection of art created from 1928 to the present, including more than 1,100 works by 185 artists. The Fishers wanted their entire collection to be on display — not kept in storage. They ultimately offered to spend $100 Million to build and maintain a museum in San Francisco’s Presidio National Park. This former U.S. Army fort is now reserved for recreational and cultural uses. When the San Francisco Board of Supervisors and neighborhood groups strenuously objected to the proposed museum location, the Fishers dropped the plan. There was talk about the collection moving to Los Angeles, among other places, but just two days before Don Fisher died, it was revealed that SFMOMA would house the collection, although it would need to expand to adjacent property to do so. SFMOMA’s exciting exhibition contains only a preview — 160 captivating works out of the 1,100 pieces in the collection are shown. In organizing the exhibit, curator Gary Garrels mirrored the Fishers’ philosophy of collecting significant artists’ works in depth. The show, displayed on the fourth and fifth floors and the Rooftop Garden, concentrates on art by Alexander Calder, Chuck Close, Philip Guston, Ellsworth Kelly, Anselm Kiefer, Roy Lichtenstein, Agnes Martin, Gerhard Richter, Richard Serra, Cy Twombly, and Andy Warhol. Unlike most private collections, it includes broad groupings of seminal pieces by these 20th-century masters and traces their creative evolution through entire bodies of work. In the fifth-floor galleries, the presentation explores in-depth holdings of five artists — with large galleries devoted to numerous works by each. Alexander Calder was Don Fisher’s favorite artist. The exhibit contains some major Calder works including a delightful small sculpture, Aquarium (1929) and eight fabulous mobiles. I wish they hadn’t all been placed in one gallery, as my eyes kept flitting from one mobile to the next. I had to revisit the mobiles at the end of the show in order to appreciate each piece individually. The seven bold and colorful iconic pieces by Ellsworth Kelly in two galleries as well as one sculpture in the Rooftop Garden, show off his talent admirably and are particularly well displayed. The four Richard Serra sculptures, although remarkable examples of his work, seemed a bit lifeless under the fifth floor lighting. The works by Anselm Kiefer and Gerhard Richter evidence the collection’s strength in contemporary German painting. Kiefer’s powerful pieces are enhanced by his use of straw on the canvases, adding depth and meaning to his works. Half of the fourth-floor galleries highlight the collection’s broad holdings of abstract art, beginning with two gestural paintings by Sam Francis, and art by Philip Guston, Lee Krasner, Joan Mitchell, Agnes Martin, Cy Twomby and Frank Stella. The three large mixed media Stella pieces, especially, The Chase, Third Day (1989), sparkle — literally and figuratively. The other half of the fourth floor centers on Pop and figurative art. 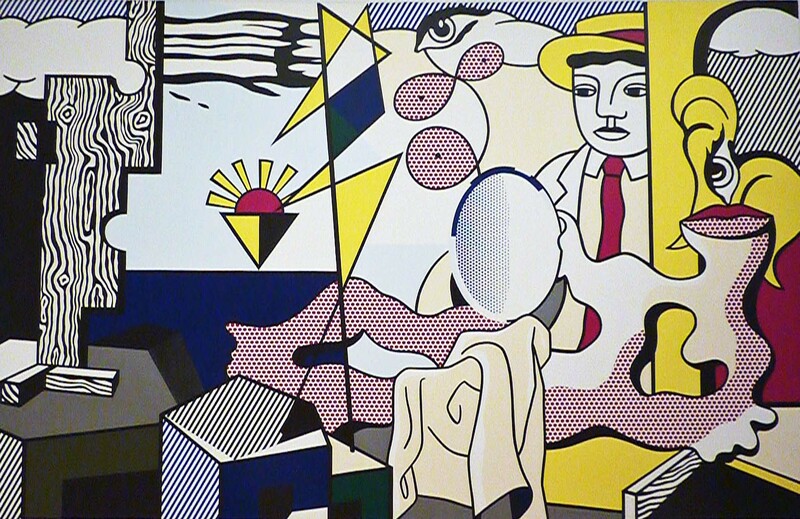 Pop works by Roy Lichtenstein include a simple small work, Radio (1962) as well as later pieces, such as Reflections: Whamm! (1990). Claes Oldenburg and Coosje van Bruggen’s Geometric Apple Core (1991) is a Pop standout. In addition, two galleries contain the work of Chuck Close, highlighting fourteen of the artist’s monumental portraits. Figurative works by David Hockney and Wayne Thiebaud are shown together. I was particularly taken with Thiebaud’s Valley Streets (2003), which draws upon real and imagined city and rural elements to create a two-dimensional dream-like cityscape. The art in Calder to Warhol-Introducing the Fisher Collection has not been on public display before. That alone makes the show exciting and thought provoking. The exhibit is also tantalizing, as one imagines the greater part of the collection that still remains to be seen.For those who wish to enjoy the best of 20th-century art, this is a not-to-miss exhibit. And don’t forget to visit the Rooftop Garden.